This webinar will introduce participants, in a case study format, to a National Institutes of Health funded educational research project at the University of Louisville, where chaplain residents train together with medical students, nursing students and social work students through a multi-modality palliative care curriculum. The "case presentation" will consider historical perspectives as well as contemporary requirements for interprofessional chaplaincy education. Preliminary data from the NIH-funded project will be discussed, with a focus on implications for chaplaincy education and practice as well as continuing education opportunities. Rev. Frank Woggon MDiv PhD BCC is the director of Chaplaincy Services at University of Louisville Hospital and Jewish Hospital Medical Center in Louisville, KY, and assistant clinical professor of medicine at the University of Louisville School of Medicine. 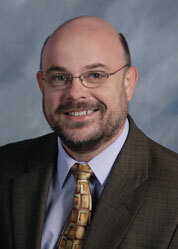 He is a certified ACPE supervisor, and an ordained and recognized Alliance of Baptists clergy. Rev. Woggon is a native of Germany. Previously, he served in parish ministry in Berlin, Germany; as the palliative care chaplain and CPE supervisor at Baptist Health Louisville; and as staff chaplain and bereavement care coordinator at Norton Healthcare in Louisville, KY.